SpeakeasyTorquay is now called Fougou Jazz. We promote live modern jazz from national, international and local artists. 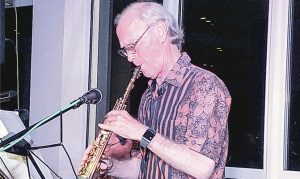 The jazz concerts are now held at the relaxed and comfortable surroundings of Churston Golf Club in Torbay, the new home for our live jazz events. To help us launch as Fougou Jazz, the wonderful reed player Paul McCandless, of Oregon fame, with his backing band from San Francisco, Charged Particles, were with us as part of their UK tour. With a good crowd and a terrific performance this was definitely the way to re-launch the jazz club.